Asking awardees if they were achievers by nature or were nurtured to be that way, Bedi said nurturing happens primarily between ages 5-13. “Parents’ role is critical at this stage. 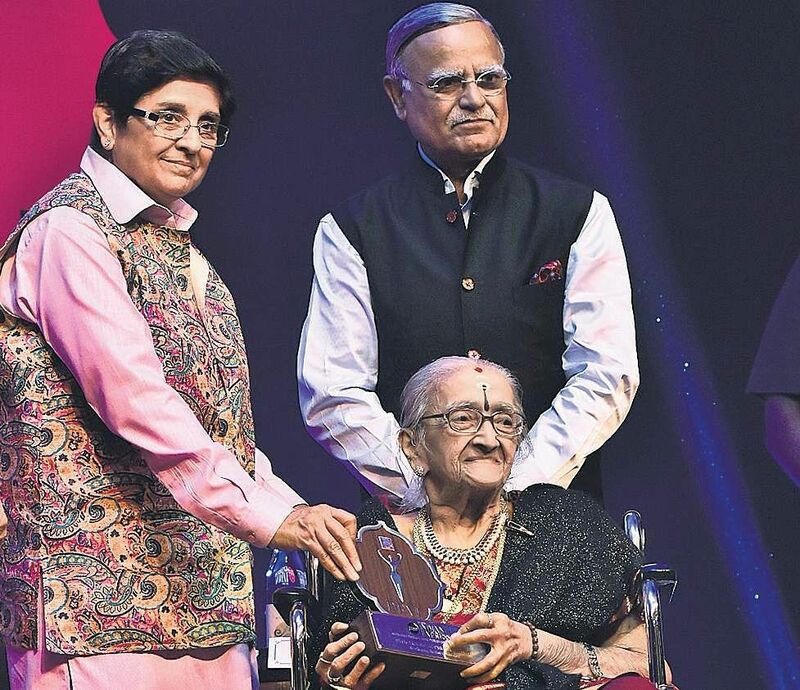 CHENNAI: Every woman who was honoured with The New Indian Express Devi award is an epitome of hard work, will power and the fight against adversity, said Kiran Bedi, Lt Governor of Puducherry, distributing the awards presented by Federal Bank here on Tuesday. The recipients were actor Aishwarya Rajesh, entrepreneur Kalavathy Sridharan, educationist Rajalakshmi Y G Parthasarathy, Collector of Salem B Rohini, poet Salma, art curator Sharan Apparao, rice historian Sheela Balaji, lyricist Uma Devi, mental health activist Vandana Gopikumar and folk artist Vijayalakshmi Navaneethakrishnan. “Each awardee is so unique and each one is a role model. They should be put on a pedestal in their fields,” said Bedi, appreciating the diversity in the choice of the Devis. Bedi as TNIE editorial director looks on. 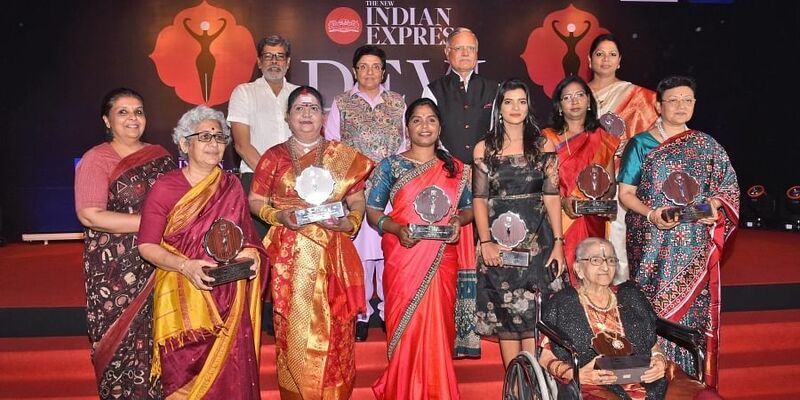 The Devi awards constituted by the TNIE group recognise the dynamism and the never-say-die spirit of women. “We as a newspaper believe that strong, independent women are the backbone of the country. Over 150 such women have received the Devi award so far,” said G S Vasu, the editor of The New Indian Express group, speaking at the event. TNIE editorial director Prabhu Chawla was also present. Asking awardees if they were achievers by nature or were nurtured to be that way, Bedi said nurturing happens primarily between ages 5-13. “Parents’ role is critical at this stage. That is what we need to pay greater attention to,” she said. Harsh Dugar, Head of Corporate and Institutional Banking at Federal Bank said women are valuable assets to the country and must be given equal opportunity to be empowered. The most powerful women aren’t always the ones who seem overtly bold or the ones who are the loudest in the gang. The most powerful are those whom you don’t see coming. The perfect testimony of this could be seen in each awardee at the TNIE Devi Awards 2018 ceremony, presented by Federal Bank. From an actor, entrepreneur to a rice historian, all of the 10 awardees from Tamil Nadu had two things in common — an iron will and lot of success. “It was one of Periyar’s books, ‘Pen Yen Adimai Aanal’ that brought me here. I wanted to break my shell and prove to the world of alpha males that women are something,” said Salma on receiving the award. She is both a poet and a writer, who was barred from completing her high school, yet was driven to change the society and its misconceptions about women through her poems. Among the crowd cheering for her was Uma Devi, also an awardee, whose lyrics are informed by her feminism. ‘Kannamma’ in Rajinikanth’s ‘Kaala’ was the lyricist’s recent chartbuster. “It is the victory of BR Ambedkar who fought for the Hindu code bill which has led to the Devi award. This award recognising literature is a recognition of political thought.” She said that his works should be translated and made available in all languages and his birthday celebrated as the National Secularism Day. One of the first gallerist-curators to dedicate herself exclusively to contemporary Indian art, Sharan Apparao wondered if she ought to have received the award as her journey wasn’t difficult at all, but enjoyable. She said it’s high time that we started selling India to Indians by introducing them to fabulous art. “Instead of buying antiques, we better buy our heritage,” the woman gallerist remarked. Entrepreneur Kalavadaniki Sridharan spoke about the challenges that women face as entrepreneurs. From being told that a dusky, Tamil-speaking woman cannot become an actor to proving to be one, the journey of Aishwarya Rajesh has been far from being easy. “They say a hero can guarantee an opening. Well, if a heroine can guarantee an opening, they should pay her equally,” she said. Folk artiste Vijayalakshmi Navaneethakrishnan said Kummi, Kulavi and Taalattu were three forms of folk art that were women’s wealth.